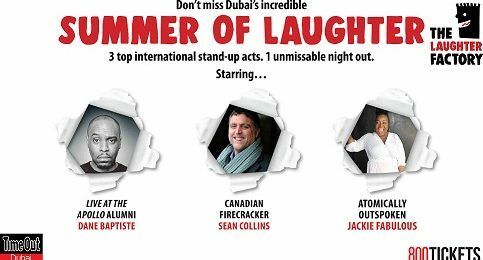 Dubai, United Arab Emirates, July 23: The Laughter Factory, the Middle East’s longest-running comedy night, is celebrating a phenomenal 21 years of bringing stand-up comedy to the UAE by offering free entry to all 21-year-olds on Friday August 3 (9pm show) at its Mövenpick Hotel Jumeirah Beach gig in Dubai’s JBR. A brand-new ‘Late and Wild’ show has also been unveiled for ON42 at Dubai’s Media One hotel, taking place on Thursday August 9 at 10pm. To mark the occasion, the club has also unveiled a new look and logo. Gail Clough, co-founder of The Laughter Factory said: “It’s been an incredible 21 years, and now that we’ve reached maturity, it’s time to grow up and show that we’re still taking the funny business as seriously as ever. We’ve never been afraid of a little nip and tuck. One of the longest-running comedy clubs in the world, The Laughter Factory was established in 1997, when two bored comedy-lovers, Clough and Duncan Jones, came together to bring regular stand-up to the UAE’s nightlife scene, kicking off with a gig in Dubai’s Hyatt Regency. Since that fateful May night, the team have brought out hundreds of A-list comics from all over the world, hosted more than a thousand gigs across the region, and hundreds of thousands of comedy fans in stitches. Many of the comics to have graced The Laughter Factory’s stage have gone on to become household names, from Russell Peters and Frankie Boyle to Dara Ó Briain and Michael McIntyre. With gigs across the UAE every single month, including pop-up shows at brand-new locations, The Laughter Factory’s commitment to giving the Emirates the giggles continues to be unwavering. The August line-up features a superlative line-up of comics who’ve recently graced the stage at one of the biggest comedy festivals in the world – Montreal’s ‘Just For Laughs’. Kicking off the fun is the UK’s rising star, Dane Baptiste. His sold out tour ‘Citizen Dane’ has had two runs of sell-out theatre shows, as well as five-star Edinburgh reviews that projected him onto ‘Live at the Apollo’ and’ 8 out of 10 Cats’. Also appearing this month, Sean Collins is firmly established as one of the best UK headline acts. Hailing from Canada, but now living in London, Collins, is almost impossible to get a date on never mind several, so we are in for a real treat this month. Finally, coming all the way from the Bronx, Jackie Fabulous is going to make the ice jump out of your drink! Not only is she a star, this ex-lawyer has a message and a lesson – and will make you leave the theatre thinking in your sleep. *Twenty-one-year-olds who want to attend should call 050 878 6728 to reserve their spot, and be prepared to present a valid national ID or passport on the night as proof of age. Tickets Dhs150 per person, available at 800tickets.com.